I am planning to do Bonnie Hunter's Orca Bay Mystery, it starts tomorrow with step one. 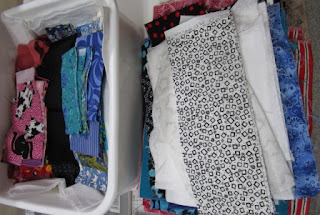 Here is a laundry basket of fabric I have picked out to use in the quilt. I am going to use mostly hot pinks and some red were she has Red. Then for the Blues I plan to use a lot of turquoise and medium blues. For my neutrals I am going to use many whites that have some kind of print of colour. I have mostly whites with bits of black. I also have some great coloured dots in the mix. For the blacks I did not have much until I went to my black with bits of white stack. 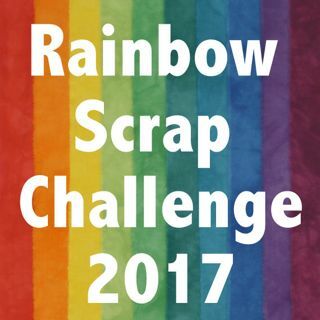 Are you going to join me? I would love to see your links to your Orca Bay Mystery too. Please share your links in the comments. I raided my bin of real scraps and boxes of pre cut strips. I got a small bin filled with the colours I need. I am sure I have more than the 17 yards of fabric all together. Ha maybe more like 70 yards and could do many more quilts. 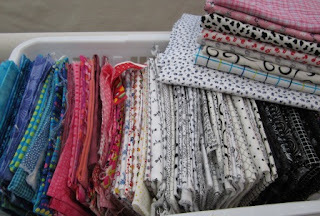 I may have to make a pieced backing to show a dent in all this fabric. 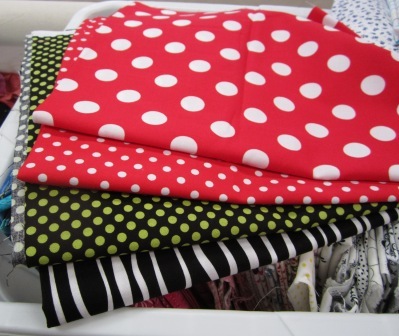 These four fabrics are in the laundry pile and need washing. But I was thinking I may use some of these too. I love the red dots, makes me think of Minnie Mouse's dress. What do you think of the crazy lime green dot on black. We will see if I use it or not. Yes I wash all my fabric. My last load of dark fabric had a runner in it and needs to be washed again. I would like to know if I am going to have a runner before I use it in a quilt. I wash so much dyed fabric it feels like little trouble to wash all the others too. I also like to know how wimpy a fabric is going to get when the sizing is washed out. 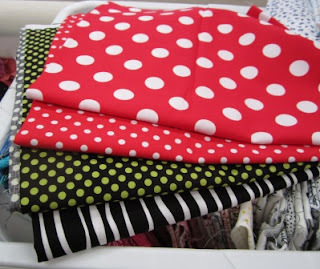 Sometimes fabric smells when I bring it home and washing takes care of that too. I am still resisting picking my colors, I'm strongly thinking lime green, turquoise and purple with blacks as my neutrals. Don't know how many I have and haven't gone and looked. Trying to finish RRCB this weekend so I can send it for you to quilt. Once its done I will let myself think about Orca Bay even thought I have lots more to do it sounds like fun and would be great to work on together.